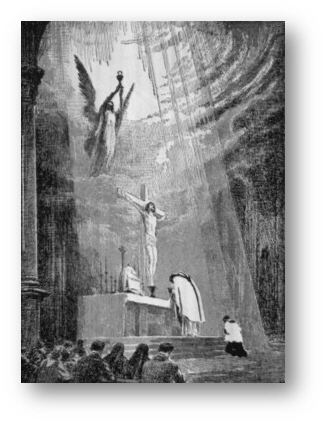 So far, we have learned this: that the MASS IS PRIMARILY A SACRIFICE. Unless we begin to grasp this, we can go no further. We are, as it were, standing at the door looking in, aware that we are in the vestibule of something deeply sacred. Beyond the doors we will encounter something that we have never experienced in our lives: the Sacrifice — not of bread and wine; not even a merely “commemorative”, still less a “symbolic”, Sacrifice. No. We will witness the Sacrifice of a Human Being. As in most things of great importance, our eyes will betray us. You know well of what I speak. The world of “appearances” that surrounds us so often as a lie. It is among the greatest of paradoxes that we are blinded by our sight, and given sight by our blindness. Things are so seldom what they appear to be: the fluted columns of “marble” within most Churches are really plaster, and the voice that greets you in kindness in the vestibule will calumniate you as soon as you leave. Our eyes tell us that this man is sinful and that woman pious, seeing nothing of the humility in the one and the pride in the other. How much love, and how much malice, is concealed from our eyes. Why, the very sky itself is not blue, but only appears so. At the door of the Church, you enter, or ought to enter, a sacred darkness. The world lies without. God lies within. Appearances must fall away the moment you anoint yourself with the Holy Water and sign yourself with the Cross. The world has passed. You have entered another dimension in which time itself is anointed with eternity. Your eyes will avail you nothing here. Here they will distract you, vex you, call you to your neighbor and away from God. Your ears will not be deafened by a sacred silence, but will contend with a thousand words that have no place in Church and in the presence of the Living God. The only one who will not compete for your attention is God. The humility of God is stunning. To Whom have you come this day? To God. Where is He? No, He is not upon the Altar. Not yet. Nor is He in the statues, if any remain. He is not even on the Crucifix ... at least not yet. But He is here. No, no ... not in the mindless aphorism that “God is everywhere.” He is truly here. He has deigned to come to a place, a specific place, and to dwell there in utter humility; a place before which you can actually kneel, lift up your face, close your eyes, and look upon Him. ... as He looks upon you. He confines Himself for you, because He knows your littleness. “But where?”, you ask with incredulity. “Where is the Living God, that I may be before Him?” How this can be you will soon understand, but right now it is only important that you realize that He is there — right before you. Not symbolically, not metaphorically — but Body, Blood, Soul, and Divinity, He is there! As really and truly as I would be, could I stand before you. You could ... in fact, you will ... even touch Him! Was Jesus still on the Cross before her as she closed her eyes? In the Tabernacle ... in that little gold House of the Living God within which He dwells really and truly ... in the Most Blessed Sacrament of the Altar ... under what only appears to be a humble Host; what, to the eyes, is only bread. Bread? Yes, Bread! “The Bread of Angels that has come down from Heaven” and which to eat is life everlasting (St. John 6:48-52). He is there! You will find the Tabernacle behind the Altar — or, sadly, often shunted off to the side, but if you look carefully, you will find it, and when you find it you will find Him! 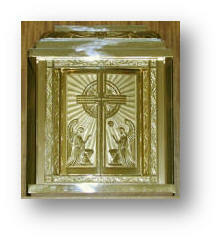 Most often it has a little door (for Him Who is “the Gate”) upon which two engraved angels face each other in adoration of Him within. But they are made merely of gold. You are made in the very image of God! Do no less than the angels ... and adore Him Who awaits you there. What we have learned today: JESUS CHRIST is really and truly present, Body, Blood, Soul, and Divinity – as really as you or me in the Tabernacle ... under the appearance of Bread ... HE IS THERE!